A Guide To The Most Comfortable And Best Mtb Grips For Numbness. Best Mtb Grips For Numbness and Comfort While Riding. Because of the kind of terrain you navigate with mountain bikes- steep, loose, and rough off-roads- your hands face constant impact. This often leads to Ulna Neuropathy or hand numbness, a problem easily check-mated using the best mtb grips for numbness. 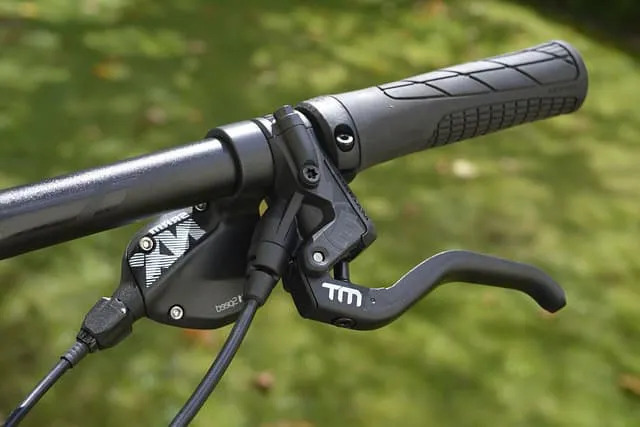 The best mountain bike grips for numb hands reduce the effects of impacts and vibrations, giving you a stable and an extremely soft mountain bike grip. This battles numbness in the hands, tingly fingers, and wrist pain. Additionally, your hands enjoy maximum comfort while the bike becomes easier to steer thanks to a strengthened grip. What Is An MTB Grip For Numbness? Small and non-glamorous, MTB grips are simply rubber tubes that you slide onto the ends of your bike bars. Mountain bike grips tread vary from the shallow to the more pronounced ‘waffle’ pattern. Why Do You Need The Best Mountain Bike Grips To Prevent Numbness? Unlike the bicycle handlebar grips that come with your bike, enhanced mtb handlebar grips make riding more comfortable. Chunky grips give you an easier hold and can absorb more vibrations. There are also thin grips that minimize road vibrations especially those made of superior materials. Recall that comfort and riding longevity are twins- the more the comfort, the longer you can ride. Grip choice affects braking control, gear shifting, plus hand and arms positioning. Quality bike handle grips that fit your natural physical dimensions, riding discipline, and style will add control to your rides- gloves or not. Most Mtb grips materials are often slip-proof and aid maneuverability even when speeding downhill. The grip is a crucial contact point to your bike so it needs to be fully supportive. Ergonomic mountain bike grips support you extremely well without interfering with your freedom of movement. This helps keeps occasional numbness and twinges away. It’s quite common to feel lingering hand discomfort on a longer trip, especially if your mountain bike is ill-fitting. A lot of typical bike fitters simply try to raise your handlebars to ease that pressure. However, it doesn’t always work and sometimes, you need something drastic like raising your saddle a little, changing the saddle, or adding an appropriate mountain bike handlebar grips. Mtb grips exists in a plethora of patterns, colors, and thicknesses. And all have one goal: to fight hand numbness in mountain biking and make your ride more comfortable! Lock-on grips have a rubber grip molded nicely around their inner hard plastic core and slide super easily onto handlebars. They have clamping lock rings holding them in place (on the outboard and/or inboard ends). Installation is simply by sliding it on and activating the locking mechanism. To remove the MTB grip, you just loosen its tightening rings or screws and take it off. Because of the clamping rings, lock-on grips are the most secure and basically never squirm or slip. Lock-on grips are also the easiest to install. Lock-on grips are not as forgiving (due to their hard plastic core) as push-on grips. Their hardware also makes them heavier than their competitors. Lock-on’s tend to be costlier, again due to their superior slip-proof performance and construction. I have been using lock-on grips for some time now. They’re super comfortable especially when on the trail the whole day and have more than a fair amount of grip even when my hands get wet. I also do lots of downhill riding and a lock-on grip like ODI rogue lock-on grip offers extra padding which makes a whole lot of difference. Installation is a breeze with the metal lock rings clamping onto the handle bars with ease. And, the same model has so far outlasted my previous two brands. Yes, these MTB grips are expensive but for me, they are very well worthy of the price. Push-on (or slip-on) grips happen to be all rubber and a bit hard to install. If you don’t use some liquid adhesive to install, you will need compressed air. The easiest way is, however, to spray an inexpensive hair spray or ordinary spray paint well inside the grip. It will be now easier to push it in. I have seen people use WD40, saliva, and even vodka as lubricants! Another method is by blowing air under the MTB grip from an air compressor. This will gradually allow you to slide the handle grip over the bar. Push-on grips can also be zip-tied – to force them to stay put- or wired on. For this, take a flat head screwdriver plus a lubricant. Pop off any end caps then insert the screwdriver in-between the grip and handlebar. Now lever the grip’s rubber up and spray the lubricant right under the grip. Now wiggle the MTB grip as you work it out of position. It should slowly slide off. Since the rubber is in direct contact with the bar, push-on grips have the best vibration damping ability and feel more pleasant. These models are definitely more affordable. They can slip when in a crash and may also not help if you’re ever biking in a heavy storm. I don’t like the installation at all. Before shifting to my current ODI lock-ons, I had used the ESI Mtb grips push-on grip. For one, they were cheaper and were quite a remarkable improvement on typical push-ons. You get excellent dry or wet grip, greater comfort, and it looks good. At around 34mm in diameter, they balance weight superbly while their silicone foam is one of the most durable. As it is the case with push-on MTB grips, these are awesome in absorbing road vibrations. Crucially, once you get hang of the installation process, they become so easy to fix. Overall, such a push-on is a great option, especially where you are looking for a cheaper choice. In some instances, a standard MTB grip design may fail to work. Among the group that doesn’t find relief in standard grips are riders with wrist issues. Now, for this group, we recommend ergonomic grips. These are more contoured and their shape fit most hands. They thus provide more support to your wrist allowing you to ride more comfortably and for longer. Most importantly, they have a way of alleviating pain to your wrist. Here is the link to one of the best ergonomic MTB grips. There are plenty of considerations to check out when purchasing comfortable mtb grips. A lot of grips are made of rubber and another compound. The latter can create a softer or harder grip. Softer compounds are usually comfier, deliver better grip, and are better absorbers of vibrations. They, however, wear out faster. Upgraded grips use several layers of various compounds to optimize comfort and durability. Silicone is another compound and is superb in dry conditions. Its one drawback is that it’s easily damaged during crashes. Foam grips have magnificent vibration damping properties, in addition to slightly conforming to your hand. Contrary to what some riders think, fat grips don’t necessarily translate to more cushioning and comfort. Exceedingly chubby MTB grips are difficult to hold and will result to an uncomfortable, panicky, and tiring grip. Riders with small hands should opt for the skinniest and lightest mtb grips possible because of the extra stability. Overall, it’s better to research the various thin/thick options to determine the most comfortable bike grips- for you. Soft bike grips can either be straight or have a contoured fit that shapes up to your hand better. The best mtb grips for big hands are those sufficiently long for your hands to grip comfortably. Longer grips are, however, not the best with small hands as they may result into other essentials such as brake levers or gear shifters being far away and hard to reach, so pick shorter grips. Wider grips spread out pressure efficiently and are more comfortable while rounded grips are the most responsive. Well, this is one of the most controversial factors and I’m of those who feel that people tend to overemphasize on the importance of a tread pattern. That being said, grips with a deeper tread pattern are more forgiving when riding without gloves even in any environment. On the other hand, a low profile tread pattern is often preferred by riders who love to wear gloves. Just some reasonable tread is enough. Avoid totally smooth grips as they may be slippery in some conditions. The overall design of the best bike grips and subsequent functionality should ideally conform to the principles of ergonomic designs. These, by far, have an improved palm grip. Moreover, they are easier to use and offer more convenience on the whole. What Comfy Grips For Numb Hands? A slimmer grip is always better because thicker models tend to grow uncomfortable a couple of miles into your ride. Thinner types also have better handling and feel. Ideally, pick a lock-on because they are easier to install/ remove. Plus, they stay put. I believe the best mtb bike grips adhere to the recommended ergonomic features. Those whose overall design conforms to a primary ergonomic design have a better adaptability and palm grip. In as much as we are talking about the best mtb grips for numbness being your savior from hand numbness, it’s important that you don’t overlook other caring measures for your hands. Mind about your positioning on the mountain bike and the setup, lest you damage more nerves and cause further pain and numbness. Also, consider talking to a professional healthcare provider in case of prolonged hand discomfort. Mountain Bike Flat Pedals Vs Clipless Pedals – Which Is Right For You? What’s The Best Platform Pedals Under 50 Dollars.